If I create a Windows 8 shortcut for a console application and set a shortcut key (cf. 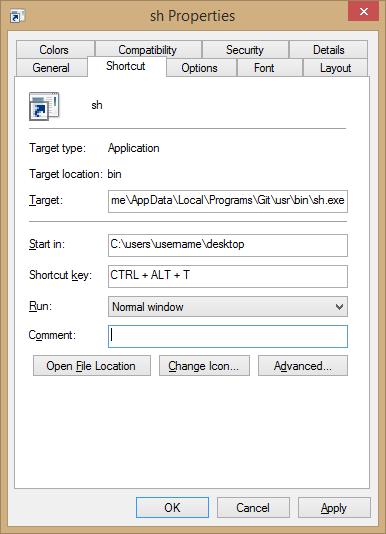 the screenshot below), then using that shortcut while the application is already open will not open the application again but rather change focus to the window containing the running application. This behavior differs from what happens if I simply open the shortcut without pressing the shortcut keys, in which case a new application is opened. On the other hand, for non-console applications, pressing the shortcut keys will open a new window even if one is already open. So, is there any way to make the shortcut keys for a console application shortcut always open a new application? The solutions to this StackOverflow question seem to suggest that using start cmd /c to run the relevant application might be helpful, but that doesn't seem to do the job in the case of shortcuts. using that shortcut while the application is already open will not open the application again but rather change focus to the window containing the running application. When you set a hotkey in the shortcut properties, Windows apply this hotkey to the window (WM_SETHOTKEY) the application creates. Of course that leads to observed behavior. If app is already started - shortcut is processed "by application window" and started instance is just focused. But when you double-click on the shortcut - Windows does not process hotkey. On the other hand, for non-console applications, pressing the shortcut keys will open a new window even if one is already open. That is because these applications ignore WM_SETHOTKEY message. And this may be considered as a bug of these applications. using start cmd /c ... to run the relevant application might be helpful, but that doesn't seem to do the job in the case of shortcuts. That is the simpliest solution. Why don't you like it? start "your bash" cmd /c sh.exe"
And configure colors via console window properties (not a shortcut). After that colors will be applied to new instances. Or you may try ConEmu. There are a lot of options, for example Default terminal feature. Not the answer you're looking for? Browse other questions tagged windows windows-8 keyboard-shortcuts console or ask your own question. How to open a second PowerShell console window from start screen?